So new issue... (most likely the result of operator error.) So after a successful print and then me messing around with the printer. I have some how messed something up... again. Now my extruder only is extruding a small amount of a plastic in comparison to how much the the hobbled bolt is and extruder gear drive is turning. It appears as if it struggling to force filament down thru the nozzle assembly. It is not clogged as some filament is coming out just not enough. My guess is that I have managed to get some extra semi melted plastic up in the threaded assembly and so it is creating resistance. My plan is to take nozzle apart this weekend. See how everything work and try and find the problem. I just hope I will be able to get it back together again and that I haven't melted any PEEK or PTFE componets. I just ordered some other parts yesterday and don't want to have to order more. If anyone has any experience or advice, It would be greatly appreciated. There are a couple potential issues that can cause that. The first is filliament shavings in the hobbed bolt chamber. if they work their way into the bearings, they can jam things up. THe filliament may also have a chunk missing out of it if you were trying to extrude and nothing came out. Undo the idler open the filliament chamber, and if it has a chung removed, pull it out and reinsert the filliament after cutting away the part with the chunk missing. You may also have idler tension set too high or too low. The proper tension is listed in the manual. There may also be a partial obstruction. if you loosened your hot end at all and re-attached it, it might not be properly alligned with the extruder body and can be causing extra friction. The NEMA motor itself is another potential source of trouble. make sure the small set screw in the small gear is tightened down and alligned with the flat part of the motor shaft. I ran into that once with my printer, the motor turned but it would only extrude a small amount of filliament. I tried pulling out the filament and checking to see if it ground through the filament. I also cleaned out the hobbled bolt teeth. I can see that it is struggling with the filament but it is making slow progress. How tight do you keep your idler bolts? I know it the manual it say keep them about 20mm away from the extruder body. I haven't taken off or loosed the hotend (yet). So I am not sure how I would have misaligned in that way. I will check to set screw but I can see the gears are moving at what appears to be the normal rate. What type of plastic are you using? What temperatures are you using? I wouldn't recommend taking anything apart just yet, you'll want to approach this in as minimally invasive of a method as possible. The above tips are a great starting point. I would look at the tension of the two screws on the extruder. You'll want to have the distance between the two silver washers around 5mm apart. Oh come on, I am an engineer! We love taking things a part and poking around (with marginal probability of getting everything back together correctly). But in all seriousness I don't want to do more than is required. What two silver washers are you referring two? 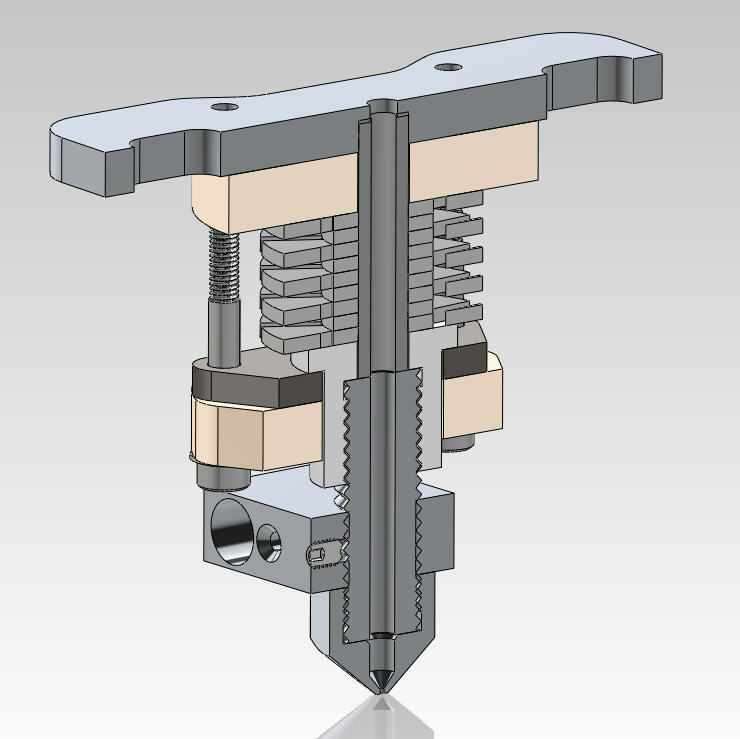 We are dealing with a "Budaschnozzle 1-1.3 Nozzles"
The two washers are on the two screws on the extruder body. Adjusting them controls the tension on the filament against the hobbed bolt that drives the filament. It's generally the first thing you'll want to look at when experiencing extrusion issues. Note: Makergeeks ABS. I don't know about their filament, but I can tell from their reels it isn't the same as ours. Don't heat your Buda above 240C. If the ABS requires it, you need to get some other ABS. Orias wrote: The two washers are on the two screws on the extruder body. Adjusting them controls the tension on the filament against the hobbed bolt that drives the filament. It's generally the first thing you'll want to look at when experiencing extrusion issues. Are these the two washer you are referring to(denoted by yellow arrows in image below)? I am confused per the manual I thought it was supposed to be 20 mm from the washer to in to the inside of the thumb screw. When I recover a little more for the holiday, I will try your filament out. I asked one the Aleph Project guys if there was any sort of deal on filament when I bought the printer. All I got was a nope, so I tried to save a few bucks on a filament and shipping. Is there any particular colors that prints really well? Those are the two silver washers. You'll find that some filament types and colors like more tension, some like less. Black ABS, LulzBot Green and Red ABS are some of my favorites.